Peel the onion, finely chop and saute in lard (oil). 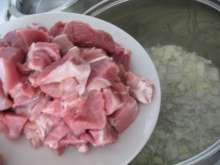 Wash the meat, remove too fatty parts and cut into the cubes. Add meat into the onion, mix until shrunk. Add salt and ground red paprika. Pour water in and braise for 40 minutes in a pot under the lid until meat softened. Dip dried mushrooms in a water and let it soak. Discard the water from mushrooms and rinse the mushrooms under the running water through the sieve again. After 30 minutes of meat steaming add mushrooms into it. 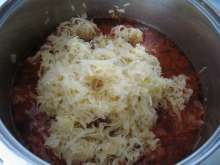 Sauerkraft is often too long so squeeze it out of sour water (do not discard sour water from sauerkraft) and cut it. If it is too sour you can lighty rinse it through the sieve. Add sauerkraft into the meat and pour in water so cabbage soup is adequately weak. 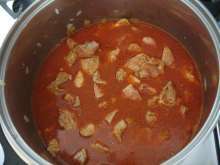 Sour water can be used at the end of cooking for extra weakening, eventually souring of the soup. Stir the cabbage soup and add sausage. 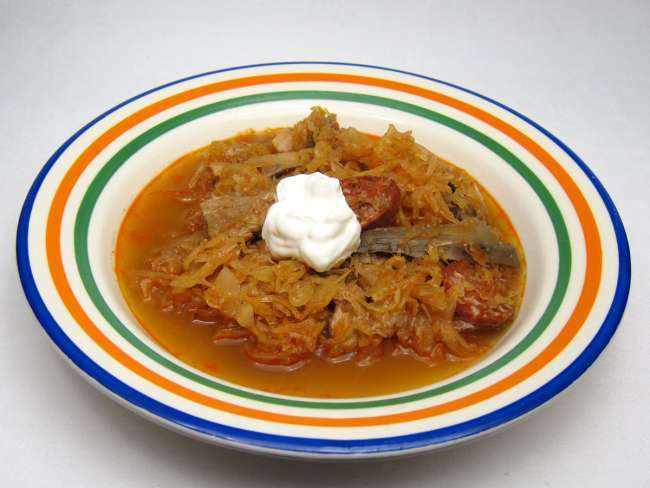 Cook it as a whole in cabbage soup for 20 minutes, then take it out, cut into the slices and toss back into the pot. Stir altogether properly. Keep in a cold place, it is good for several days. Usually it tastes the best the second or third day since cooked. So cook it in a larger quantity. Except for sausage, it is very healthy meal, full of vitamins.